A full page interview on RepRap in the NRC, a dutch quality newspaper! bacharakis http://twitpic.com/11v2xl – At reprap talk! this is a 3d printer! tyll:I like the #reprap talk on !fosdem !fosdem2010 currently running. Nice vision: Use old child shoes to create bigger ones if needed #fosdem from identi.ca. It was also featured in the Dutch newspapers NRC and NRC.next, Belgian newspapers and blog posts here and there. Also, me and some other Protospace RepRappers were on television last weekend! See it on Youtube here or on the TV station’s website here. 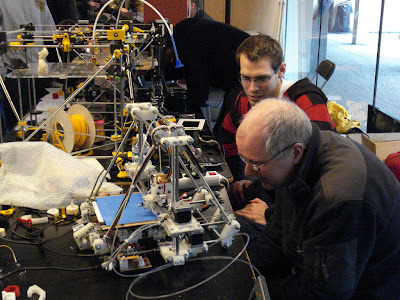 All-in-all, great publicity for the RepRap project! Previous story RepRap made the Dutch newspapers! This is Kieran, I was with Gaetan at Pablo’s when Adrian came to dinner. have a few questions to ask.